Some folks believe vinegar pickles originated in the Middle East, which may be true since there are entire stores devoted to pickles in Istanbul, Turkey. These pickles are part of a traditional spread known as mezze. Serve them with several kinds of olives, fresh tomato wedges, cucumber slices, hummus, stuffed grape leaves, or grilled meat. In a large nonreactive bowl or jar, combine the vegetables, garlic and red pepper flakes to taste. Mix well. In a large nonreactive pitcher or bowl, combine the vinegar, water and salt, whisking well to dissolve the salt. Pour this mixture over the vegetables, mix gently but well, and cover the container with a clean cloth or napkin. Allow to stand at room temperature for 3 days, then cover and refrigerate. These pickles can be eaten right away but their flavor improves over several days. 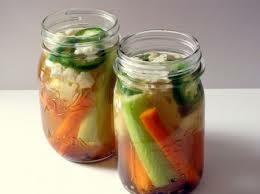 Pickles will keep covered and refrigerated for at least 1 month, if not longer.